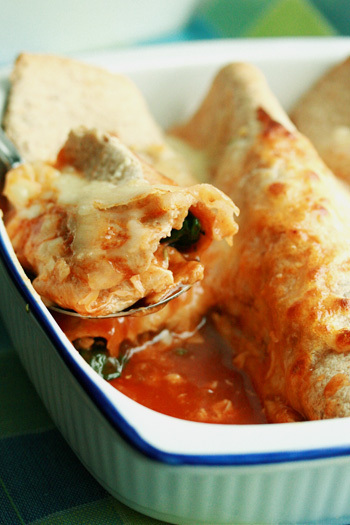 Traditionally, enchiladas are soft tortillas dipped in salsa, filled, and then baked. In my version, chopped tomatoes mix with spinach and jalapeño to make a savory “salsa” on the inside. 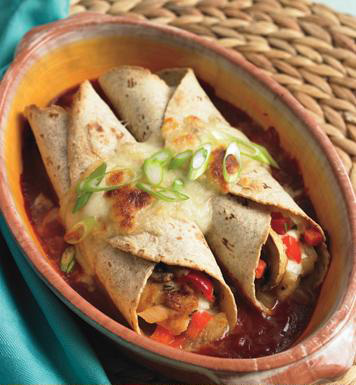 Enchiladas are a great dish to make-ahead dish that can be gently warmed before serving. Set out a 8X12 baking dish. Preheat the oven to 400° F.
Heat a large skillet over medium-high heat. Add olive oil. When oil is hot add the onion, jalapeño, and garlic. Cook 7 to 8 minutes, stirring occasionally, until the onions begin to soften but does not turn brown. Add the tomatoes along with their juices, can chopped green chili peppers, chicken, and oregano. Cook 2 to 3 minutes more, stirring often until the chicken is cooked through. Stir in the spinach and cook 1 minute more to wilt. Wrap ½ cup of the chicken mixture in each tortilla. Lay the tortillas seam-side down in the baking dish. Spoon the remaining tomato sauce from the skillet around the tortillas. Sprinkle the tops of the tortillas with the cheese and bake 20 to 25 minutes until the cheese is melted and the tortillas are warm. Bake 10 to 15 minutes uncovered until the cheese begins to brown and the filling is warm. Serve immediately.